In the UVS worldview, the universe can be considered as a manifestation of a unisonal vortical motion. In the beginning of the universe, there IS this aetheric eternal light that infinitely transcends space, this infinite eternal light that is all-pervasive also transcends time; the eternal light is omnipresent. Note: The verb "was" is not applicable in a timeless realm, thus the verb "IS" in full capital was used instead. So instead of the phrase "At the beginning", "In the beginning" was its deliberation. See the UVS topics on "Unisonal evolution mechanism" and "The structure of the observable universe" that illustrate a unisonal vortical hypersphere paradigm of nature. This metaphysics abstract of UVS on naturalistic cosmogony, is a philosophical theory of everything that attempts to explicate on the nature of reality. In the wake of the universe, the superluminal harmonics of the eternal light, conceive the vortical universe in a delimited bandwidth with a unisonal vortical motion of aether, and thus renders it perceivable in the physical framework of reality. This concept hypothesized with the UVS model that depicts unisonal vortex, is meant to be an ultimate and all-encompassing explanation for the ontology of the objective reality, and how all things in the universe systematically emerge to physically exist. In a vortical paradigm, the evolution process with a unisonal vortical motion manifested in the three-spatial dimensions of absolute space, begets everything in macrocosms and microcosms to vortically emerge, exist, and dissipate in the temporal dimension of time. In resonance with the unisonal vortical motion harmonizing in the aetheric medium, it vortically coalesces the vortically emerged matters to form as celestial objects in the apparent nothingness of vast physical space. In the UVS worldview, the observable universe is manifested in the closed system of the vortical universe, and this is evidently substantiated with ubiquitous empirical observations of natural phenomena that are vortically manifested throughout the macrocosms and the microcosms. See the UVS topics on "The CMB dipole", "The structure of atom", and "The evolution of stars and galaxies" that illustrate on vortical structures in the macrocosms and the microcosms. From the UVS perspective, the vortical universe in absolute space and time, can be perceived as a vortically formed cosmic atom with a vortical hypersphere system of 137 nested 3-spheres. This hypersphere harmonically spawned 137 cosmic spinor fields in its vortically weaved nested cosmic electron shells and their nested cosmic subshells, and thus renders the fine-structure constant in its vortically manifested elementary particles. This four-dimensional structure of the hypersphere system with all its harmonically spawned spheroidal unisonal vortices, are energetically manifested and impelled by the aether vortical motion of the vortical universe. In a four-dimensional space of 3-sphere hypersphere system, it could render the perception of an infinite three spatial dimensions of absolute space in the objective reality of the vortical universe. Absolute time in the three-spatial dimensions of absolute space, is merely a concept that transcends all physical locations in the vortical universe, and thus in the physical aspect it has the characteristics of eternity, infinity, and infinitesimality. Unisonal vortical motion of aether, is the underlying physical law of the objective reality. The electromagnetic vortical harmonics with magnetic reconnections in the vortical hypersphere system of 137 nested 3-spheres, vortically weaves nested bipolar plasmoids in macrocosms and microcosms with dynamically resonated vortical singularities that are discernable everywhere in the conceived vortical universe. In the vortical universe, with the dynamics of a perpetual vortical motion from its open system transferred into the almost all-pervasive aetheric field, which resonates in its inviscid medium to manifest as quantized aether corpuscles in the form of nested spheroidal unisonal vortices, it evolutes to weave vortexes in all sorts of resonated vortexes. In the UVS worldview, the vortical universe impelled by aether vortical motion from an open system, is manifested in a closed system of a perfect universal cellular clockwork machine of unisonal vortex mechanism with its gears governed by the laws of physics, and it is therefore conformed to conservation of energy in its nested vortical encapsulation. The vortical motion of aether manifests the phenomenon of energy in the closed system of the vortical encapsulation, energy therefore cannot be created or destroyed in the steady state vortical universe. And in its resonated vortical motions, these beget all transient existences. Despite vortical motion is not any sort of physical existence at all, the universe with an underlying vortical motion in a grand-scale transcendental state that is beyond our observational bandwidths, weaves and sustains the existence of the vortical universe; the vortical motion in an open system of apparent nothingness causes the vortical universe to persistently exist in its closed system with a vortically induced perpetual unisonal motion. With the potential of vortical motion from an apparent nothingness of non-material existence that paradoxically transferred from the open system, all physical existences are vortically weaved and delimited in a closed system to emerge in the almost all-pervasive inviscid medium with the perpetual vortical motion. And thus, all these existences with physical limits, are therefore inherited with the vortical hypersphere characteristics of infinities and infinitesimalities. “Whatever has come into existence, must also pass away with necessity. - Anaximander, "Father of cosmology", "The first true scientist". The harmonics of infinitely dilated vortical motion, with varying degrees of freedom in the inviscid aetheric medium of the vortical universe, resonate in a top-down manner to manifest the ever smallest physical forms possible with the vortical motions that consolidate toward infinitesimalities. This freedom of vortical motions in the inviscid aetheric medium respond to the law of conservation of energy, therefore are intrinsically counteracted by the vortical systems resonated in their nested closed systems. And thus the vortically resonated physical forms of the microcosms, subjected to their physical laws in the vortical universe, will orderly coalesce in a bottom-up manner for the formations of the ever largest nested vortical structures that could be physically possible in the cosmos. Evidently, space is filled with the electromagnetic field of cosmic microwave background radiation, and in fact there is no space empty of field. From the UVS perspective, all steady-state physical structures are held stable by the unisonal vortical motion of an almost all-pervasive inviscid medium, and are condensed with resonated electromagnetic fields of different wavelength that propagate at the speed of light. All steady-state physical structures are vortically consolidated, and are held stable by a unisonal vortical motion. Note: Electromagnetic field is categorically not a physical object, yet this masslessness phenomenon of nothingness could exert physical pressure on physical objects in its path; this is an example of a natural phenomenon of nothingness that is a physically discernible something in nature. See externally linked topics on "Scientists discover how to turn light into matter after 80-year quest", "Baryon number" that infers some particles are apparently nonexistence when their baryon number is zero, "Gauge invariant" that elaborates on different configurations of underlying fields that are not themselves directly observable but result in identical observable quantities, "Electromagnetic spectrum" and "Electromagnetic radiation" that elaborate on how energy and momentum in electromagnetic field could interact with matter. Heuristically, the emergence of all physical structures, are fundamentally formed by the universal mechanism of unisonal vortex in a unisonal vortical motion of the vortical universe. The manifestations of physical structures with their resonated vortical motions are intrinsically topsy-turvy in the vortical universe, and thus in the objective reality, the entire observable universe is subliminally paradoxical. From the UVS perspective, all material structures of organic live forms are differentially impelled to form in the paradox of potential conserved by the perpetual vortical motion of the aetheric medium. And in the circumstances of observational limitations, this almost all-pervasive medium could be perceived as an entity of nothingness with vortical motion that transitory begets all physical existences. The attributes of awareness for any life form, are conceived in this paradox of potential in the paradoxical material phase of its resonated aether vortical motion, which thus forms and renders the cognitions for the awareness of all life forms. The cognitive functions that had evolved to work for the observer's awareness in his localized circumstances for pragmatic purposes in his environment, are naturally negated from transcendental perspectives, and thus would cause all sorts of delusion. In the localized perceptions of the observer with all sorts of natural cognitive paradox that are subliminally caused by the paradoxical effect of nature, the entire observable universe is therefore naturally paradoxical to its paradoxically conceived observers. Consequently, the omnipresent eternal light in its all-pervasive inviscid medium, are negated from the perceptions of the physically formed observers. The omnipresent eternal light is everywhere, but it cannot be seen anywhere. And in all possibilities it therefore naturally render all sorts of cognitive paradox to subliminally negate the observations of natural phenomena. All physical objects inherently have to exist in space, which is a nothingness, and all star systems with their planetary systems within the vortical system of a galaxy follow the laws and orders of its vortical gravitational singularity, which is a virtual barycenter, and this is also a nothingness in the objective reality. Yet this nothingness can manifest a supermassive black hole phenomenon, which is another type of nothingness that is apparently void of any physical thing, but this can physically shred and then devour a star if one has moved too near. And evidently, the shredded star stuff could apparently vanish into this nothingness. 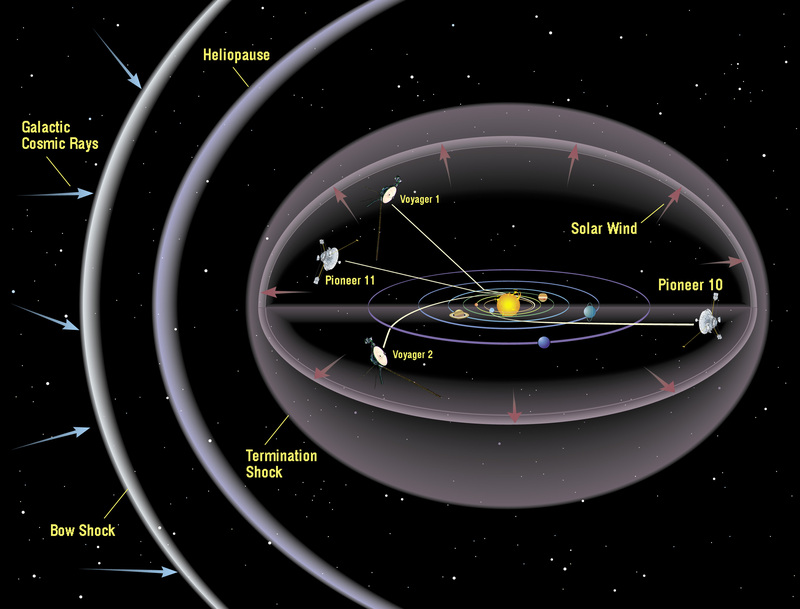 See the UVS case study on "The barycenter drivers of the solar cycle" that illustrates how the nothingness of the Solar System barycenters were driving the solar cycles. All physical objects are ruled by the motions of their nonmaterial vortical entities. From the UVS perspective, light could not escape the gravity of a black hole, infers the carriers of light wave have the property of mass, and thus they could be interacted. Although light wave propagating in the aether corpuscles of light (the quantas of luminiferous aether) is weightless like sound wave, these aether corpuscles of light are being vortically displaced in the black hole, light thus could not escape or illuminate in a black hole. The empirically observed temperature of a rotating black hole is almost absolute zero, asserts the existence of an almost all-pervasive aetheric medium that vortically spirals in its closed system. The surface of the supermassive black hole should be a cold blazing source of superluminal light that is extremely brilliant throughout the galaxy, but beyond instrumental bandwidth in the objective reality, it is undetectable and therefore not observable at all. Visible light is merely the radiation of electromagnetic field in the optically visible bandwidth, and the night sky is entirely filled with the radiations of electromagnetic field from the harmonics of the superluminal light. It is obvious that all physical objects in the universe are relentlessly ruled by all sorts of of nothingness, which are not physical objects at all in the objective reality. Despite these discernable nothingness are apparently immaterial in the objective reality, they underlies in all matters for them to physical exist, and these beget all sorts of natural duality in the objective reality. All existences are zero sum manifestations in the countervail dichotomies of aether vortical motion. In the UVS worldview, with energy transferred from the manifested aether vortical motion in the vortical hypersphere system of 137 nested 3-spheres, all matters are thus vortically resonated to form their physical structures. All matters are vortically coalesced as physical structures by resonated electromagnetic fields of different wavelength with intrinsic energy conserved in the hyperspheres of their two axis-spins, and their intrinsic energy are conserved by the kinetic energy (½mv²) transferred to the two axis-spins with resonated electromagnetic fields that propagate at the speed of light (c) in all directions. From the aetheric perspective, this intrinsic two axis-spin of aether corpuscles at the speed of light, elucidates the causality and origin for the mass-energy equivalence of matter. The energy that manifests the vortically resonated mass effect of matter, is rendered by the kinetic energy of matter in its intrinsic two axis-spin at the speed of light in each of the two axes, which is transferred from the aether vortical motion of the universe in its two-axis spin; E = ½mv² + ½mv² = mc², where m is mass, v is velocity, c is speed of light, and v equals to c.
This quantifiable paradoxical phenomenon of matters (m = E/c²) with physical properties manifested from a nothingness of nonmaterial existence, infers that any existing object in the objective reality, is merely a manifestation of aether vortical motion in its primary two-axis spin at the speed of light. Watch a video clip on "Vortex Physics - The Superfluid Universe" that elaborates on how a spheroidal pressure system of an electromagnetic torus structure with the energy over its volume, could be derived as e=mc² from an acoustic wave equation. See an externally linked topic on "Scientists work out how create matter from light, to finally prove Einstein’s E=mc2". See the UVS topics on "Conceptualized structure of nature", "Qualitative evaluation on time dilation", and "Faster than light speed in transferring of motion through vortical interconnectedness". See also an externally linked topic on "Maya (illusion)". Physical objects that have vortically coalesced to exist by electromagnetic fields of different wavelengths, are analogous to ideas of nature. Although objects are solidly real in one bandwidth of electromagnetic field, they can be a hollow state in another bandwidth. Some illustrations for this, are light can pass through clear diamond or clear glass, but cannot pass through opaque objects. And electromagnetic field at certain wavelength, can radiate through optically opaque solid wall and other physical forms that their state of matter are relatively hollow, yet it could not pass through glass that is optically clear. The objective reality we are conceived in, can be perceived as a persistence illusion from a transcendental perception; all states of matter and all physical structures are withheld vortically by electromagnetic interactions in different wavelengths. Objective reality is merely a persistent illusion of vortical motion in the eternal now. In a state of nothingness beyond observable bandwidth in the realm of the delimited observable universe, that which is naturally real, is the underlying eternal light that renders the undulating harmonics of vortical motion to manifest the transitory three-dimensional objective reality. All matters and existences are harmonical compositions of vortically condensed light. We are vortically made of light! The understanding and trying to make sense of the world. A category of paradox with illusions that are pertaining to perception or awareness, such as with relative motion illusion, optical illusion, tactile illusion and the likes. Division into two parts, kinds, etc. ; subdivision into halves or pairs; division into two mutually exclusive, opposed, or contradictory groups. To give intellectual light; impart knowledge to; to shed light upon. The manifold of infinitesimality; manifold of decreases to indefinitely small that are immeasurable. The manifold of infinity; manifold of increases without bound. A naturally rendered contradiction that is counterintuitive. A natural phenomenon is a non-artificial event in the physical sense, and therefore not produced by humans, although it may affect humans. A state of existence beyond perceivable bandwidth therefore renders as nothing in the perceived state; the state of being nothing. Any thing, or situation exhibiting an apparently contradictory nature with false proposition. The region, sphere, or domain within which anything occurs, prevails, or dominates: the realm of dreams. A geometrical figure similar in shape to a sphere, such as an ellipsoid. The totality of known or supposed objects and phenomena throughout space; the cosmos; macrocosm. It is beyond the defined observable universe. Having the property of viscosity; sticky. A spheroidal culmination of aether with vortical motion that unisonally spawns its resonated and nested satellite vortical fractals in its vortical paradigm. - SB_UK of TOEQuest Forum inspired by UVS. - James A. Graber (aka Jag of TOEQuest Forum) with twenty-eight years into vortex research, 8th Aug 2012. - Allen Barrow (aka PoPpAScience of TOEQuest Forum) and Vincent Wee-Foo. ~ With special thanks to Allen Barrow for sharing his insight on: The "Vortex" is strictly a "mechanism" that is an "Ideal" in nature, and not a substance. ~ With credit to Allen Barrow for his insight that a form such as a vortex that human perceive it to be physically real, is merely an idea in nature, is formed by fictitious force interactions as a "something of nothing". Excerpt: "If you walk into any of the many vortices that we see everyday and scoop into the effect with a test tube, you will not find any something that can be seen or studied that could be called a vortex particle. Yet we can see with our own eyes, the effect the vortex has on the material, that becomes involved as both the cause and effect, of this something that (apparently) is a nothing (Paradoxical Vortex)." Note: This philosophical theory of everything (TOE) for naturalistic cosmogony is a conceptual basis on a metaphysical point of view. Despite the unobservable phenomena are explicable and discernable with supportive empirical evidence, there is no way to objectively prove the ontological propositions with what are beyond the limits of instrumental measurement capability. Nonetheless, for elucidating a missing premise for the causality of the observable vortical universe for how the objective reality come about into existence at the first place, and subsequently its aroused self-awareness, this philosophical TOE is consistent with the UVS model, and with loads of compelling evidence it provides the insights for the genesis of the cosmos. Absolute time - From the website of Exactly What Is Time?